Sitting down with my interrogation reports is never fun. But it always makes me wonder what I’d be able to find if I had all of those numbers plugged into a database or spreadsheet. My clinic is unable to send me reports electronically, and so my only choice is to have them printed out on letter-sized or 110 mm thermal paper, which fades over time. But if I want to know how my device’s battery is performing, I have to spend a little time combing through all the pages of my reports and entering the numbers I find into Excel. 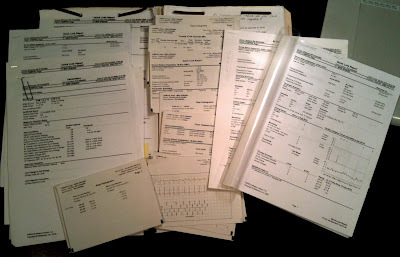 I have all my printouts since the day after implant, 3 1/2 years ago, 44 months ago to be precise. In this amount of time, I’ve had 16 device interrogations, including two of them during a cardiac rhythm class I took at the Arrhythmia Technologies Institute (ATI) earlier this year. 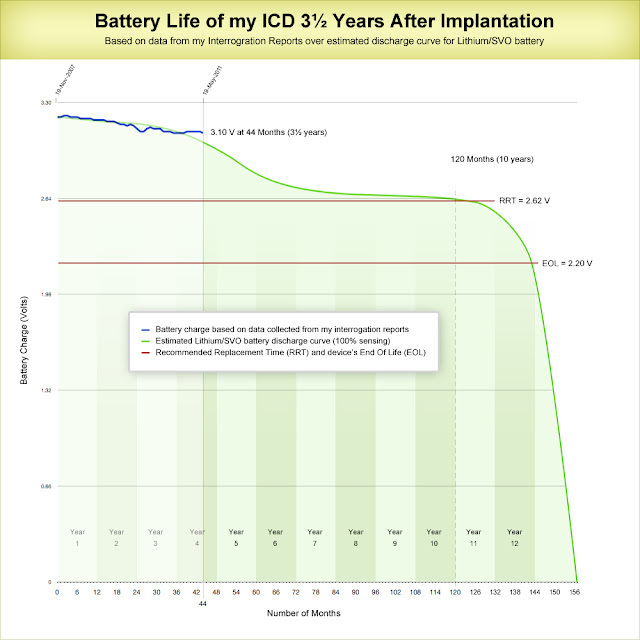 The above graphic shows the battery depletion curve of my ICD in comparison to an estimated Lithium/SVO battery discharge curve found in my school materials. 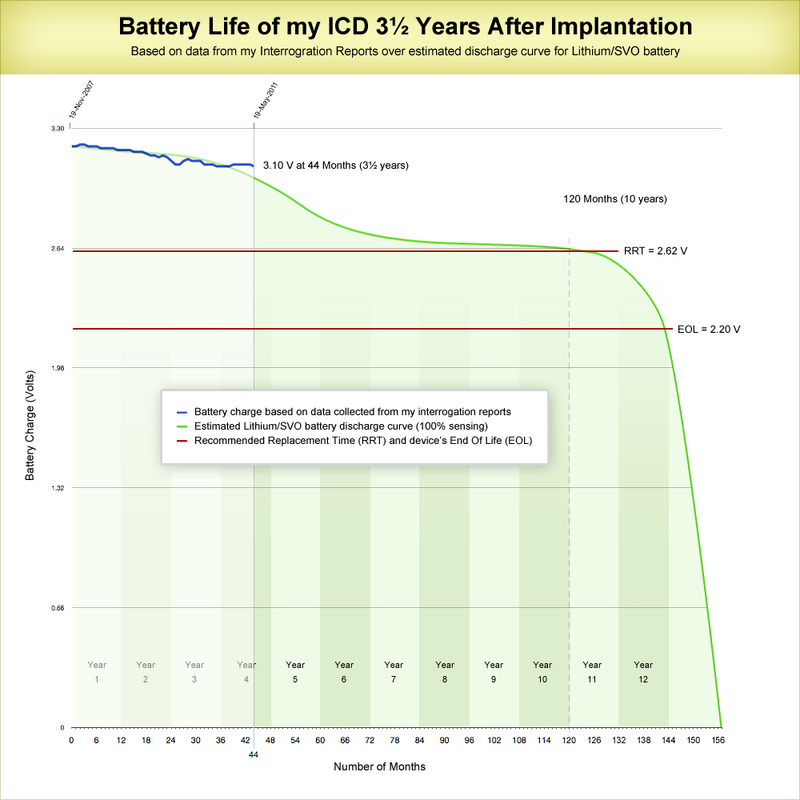 I also took into account the estimated longevity published by the manufacturer for this model of ICD at 100% sensing and with semi-annual capacitor formations (as it is in my case). It’s only an estimation, but it shows that my implant battery seems to be behaving according to plan. It’s an example of how access to our data can give patients some peace of mind. And aside from not getting a shock, that’s all I can hope for. You can get reports from your doctor's office like you mentioned if you had a Boston Scientific OFF through Latitude. Also, Boston Scientific devices tell you monitoring voltage AND longevity remaining based on current settings. Very easy at a glance to figure out how long you have until a gen change! @Anonymous 7:54 AM — Maybe so. But no manufacturer makes this information conveniently available to patients. I find that objectionable. i have received unnecessary shocks caused by negligence and when i ask for the cause they told me my icd does not record this information!!?? Has anyone had there leads changed because of the recent recall? I just found out that I am on the recall list and my battery will need to be changed within the next 6 months. Is it best to wait out the battery and possible shock or tear from a loose lead? Or is it better to have everything changed out as soon as possible? I can't find much information on dangers of changing out a lead.